Complex drawings can contain similar or even identical elements. As a result of the structural analysis some can have the same reinforcement. For these situations Advance Concrete provides the option to copy the entire reinforcement. The "Copy 3D model" option can only be accessed from "Advance Reinforcement 3D Viewer" in the Drawing mode. 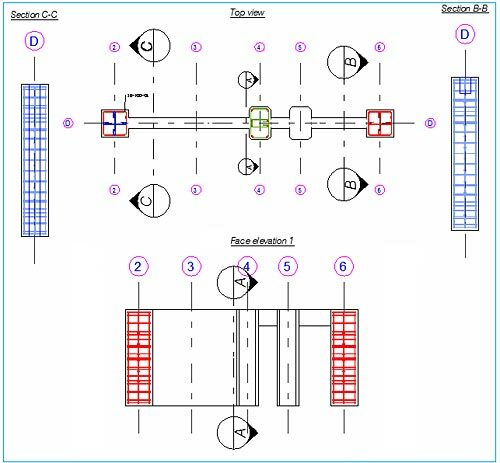 Consider a reinforcement drawing with 2 identical columns. One of them has been reinforced using manual or automatic reinforcement. 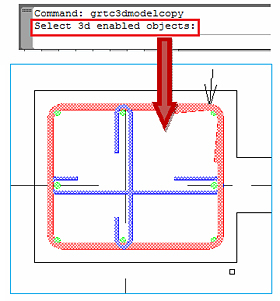 To copy the reinforcement from one column to another, use the "Copy 3D model" option. On the command line the selection of the objects for copying is requested. 3D object means the definition bar with its distributions, from all the views. The selection will be done from only one view. After selecting the reinforcement, first you have to select the "Base point" and then the second point, where it needs to be placed. When the command is over you can see that the reinforcement has been copied in all the views. This option has the advantage that you only have to copy the reinforcement in one view and it will be automatically placed in the other ones as well. Note: "Copy 3D model" works only for elements in the same reinforcement drawing! This option cannot be used for elements in different reinforcement drawings or different models. For the reinforcement drawing were this option would be used, "3D power" must be activated.